Hop aboard these environmentally friendly twin-hulled catamarans sporting black and white checks and enjoy the ride. Take in the grandeur of New York and see spectacular views of Manhattan as knowledgeable guides point out the famous landmarks. This 4 1/2 hour tour covers pizza... and Brooklyn... from one end to the other. 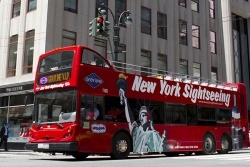 Enjoy the best prices for deluxe double decker, hop-on, hop-off bus tours that include Uptown, Downtown, Brooklyn, and Night loops. 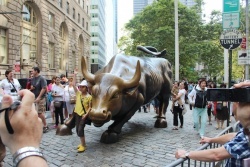 Wall Street Walks takes visitors through the historic capital of world finance. 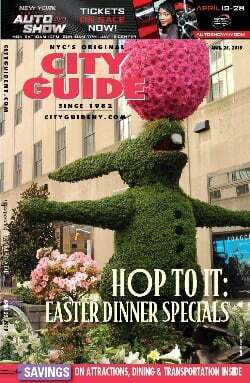 The Guides' Association of New York City (GANYC) is an association of independent, professional tour guides based in New York City. Each member is licensed by the New York City Department of Consumer Affairs. An immersive and interactive entertainment experience that moves you through midtown as an ever-changing show featuring actors, performers, and citizens unfolds. Take a tour of Yankee Stadium and learn the history about the 27-time World Series Champion New York Yankees! Get up close to historic baseball artifacts, visit exclusive locations, and learn about the various events that take place at the Stadium. Liberty Helicopter offers four spectacular tours to choose from catering to every budget and each offering a different route. Helicopter Flight Services offers tours that include the Statue of Liberty, Central Park, Yankee Stadium, the Financial Center and more. 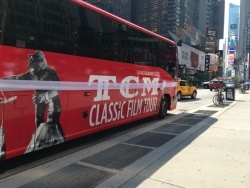 THE TOUR is a 90-minute immersive ride through midtown and the Upper West Side in THE RIDE's multi-million dollar custom motor coach. Cruise along the harbor and enjoy waterfront sights of the New York skyline as a guide provides a detailed narrative. 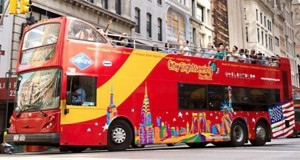 Get all of the best of NYC with the SightSeeing Pass NYC, from CitySightseeing. You can mix and match your way to a complete experience, with more than 100 attractions and special discounts to choose from. On Location Tours is New York's premiere TV & movie location tour company, offering an exciting way to see the most filmed city in the world. Grand Central Terminal, 89 E. 42nd St. The Grand Central Terminal Tour is the official tour of the station. The one-hour self-guided audio tours take visitors across the terminal's many historic points, including the famous Whispering Gallery and astronomic ceiling, the Biltmore Room, and the iconic information clock.